Ciao Wireless specializes in Low Noise and Medium Power Amplifiers & Subassemblies for Commercial, Defense and Hi-Rel applications. Designs are offered from 1 MHz to 50 GHz covering the various standard and speciality narrow and wide bands in-between. Products are available for most applications including Low Noise Amplifiers, Medium & High Power Amplifiers, Narrow, Broadband and Ultra Broadband Linear and Limiting Amplifiers, Surface Mount and KA-Band Amplifiers. 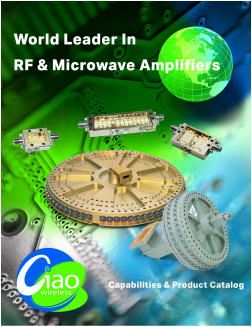 Ciao Wireless designs and manufactures Radial Power Combiners and Dividers for high power solid state transmitter and amplifier applications. All of Ciao Wireless product designs are suited and qualified for use in EW, ECM, ESM, Radar including SAR, Decoys, Seekers, Simulators, Missiles, Data Links, Test and Measurement, UAVs, Satcom and Commercial Communications Systems. 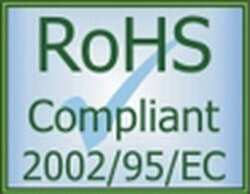 Ciao Wireless is ISO 9001:2015 and AS9100D Certified. 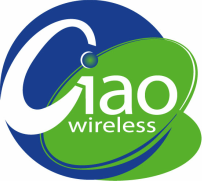 Ciao Wireless passes ISO 9001:2015 and AS9100D 3 year Recertification Audit. NEW Models have been added to Ciao’s broad product line featuring lower noise, higher output power, and higher and wider frequency bands of operation. Continue to check here as Ciao continues to add new design capabilities to our product lines. Ciao Wireless offers Low Phase Noise Amplifiers and features In-House Phase Noise Testing capabilities (AM & Residual). Please contact Ciao Wireless for all of your Low Phase Noise Amplifier requirements. Ciao Wireless features a new line of Ultra-Low Noise Amplifiers with typical noise figures as low as 0.3dB. Click here. Ciao Wireless has introduced a line of ultra wide-band amplifiers with instantaneous wide band frequency coverage over 1.0 to 40.0 GHz featuring an integrated output power detector in a compact size. View the article as featured in 2015 Microwave Journal magazine. Click here for Tech Brief Editorial. Wideband Power Amplifiers, 2 -22 GHz Output Levels up to +32 dBm. Click here for details. High Linearity LNA’s, Feature 16-17 dB of “Headroom” Between P1 dB & Output ICP3. Click here for details.